These are questions where a group of five or six two dimensional shapes or elements are presented and you need to determine which groups are rotations of each other. This is slightly more complex than the rotations in the two-dimensional shape matching questions. 1) Which of the Answer Figures is a rotation of the Question Figure? You need to be careful that you don’t identify reflections. The best strategy is to choose the most asymmetrical shape in the group – in this case the arrow. Then determine the shapes ‘clockwise’ and ‘anticlockwise’ and opposite. Thinking in these terms is more logical than ‘right’, ‘left’ ‘above’ or ‘below’ as ‘clockwise’ etc are constant even when the figures are rotated. In the example above, the white square is clockwise from the arrow. This means that A, B and D cannot be rotations of the Question Figure. This leaves only C as a possibility which can quickly be checked element by element. Remember that no logical manipulation of the figures is necessary, you are only interested in identifying which of the answer figures is identical to the question figure. 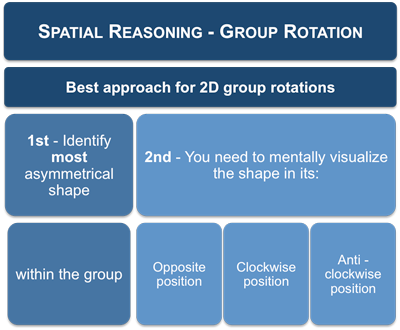 These spatial rotation questions are very common and are used in the tests supplied by many of the major test providers. Because rotation only requires manipulation in two-dimensions, these questions are much easier than the three-dimensional cube questions.